Becoming a Disney character at one of the parks is something a lot people dream about becoming. You’d have the chance to dress up and make lots of children happy every day. However, in becoming a character Cast Member, you’d have to abide by some pretty strict requirements. There are height restrictions on all Disney characters. You may have aspirations of being a Disney princess, but if you’re too tall or too short, you won’t get it. This is done so each character can be consistently represented. If one Snow White is 5’2” and another is 5’9”, it’s more obvious there isn’t one princess. For character audition calls, the requested height requirements will be posted so you’ll know right away if you can meet this requirement. While Disney doesn’t put restrictions on weight and body type to be mean, there are restrictions here as well. This has more to do with the fact that the character costumes online come in so many sizes. If you were to gain weight, they cannot make another costume for you. If you don’t fit into the costume, you can’t play the role. Every few month character Cast Members get checked to ensure their silhouette hasn’t changed and they are still qualified to play their assigned role. This is more strictly observed for the face character roles. Depending on the character, there are also age restrictions. If Alice is supposed to be a young girl, she can’t be played by someone in their thirties. Some characters require a minimum age of 18 while others can be hired at 16 with parental permission. The furry characters, the ones with a mask like Pooh, don’t have as strict requirements when it comes to an age limit as the guests never see them anyway, but face characters have only a certain time frame. If hired to play a Disney character, you’ll undergo an intense training session where you’ll watch and re-watch your character’s movie to learn diction, mannerisms, and key lines from the movie. You must be able to step into that character and know everything about them. Once you’ve learned everything there is to know about your character, you’ll be required to stay in character any time you’re interacting with guests and in public view. If someone is rude, you need to continue being your character. If the weather is too cold or too hot and you’re uncomfortable, you still need to act as if everything is perfectly alright. If you’re a face character, you have to smile the entire time. At no point can you drop the grin. Especially with the additional use of smartphone videos, characters are always in the spotlight and they cannot be seen for a moment looking upset, uncomfortable, or tired. During the audition process to become a Disney character, there will be a dance portion. Typically these are simple, routine steps much like what you’d see at a parade or at a show in the parks. Dance experience isn’t needed, but you should be able to follow instructions, stick to the rhythm, and keep a smile plastered to your face the entire time. Even if you’re character doesn’t dance, Disney wants to know who they can select for shows and parades in addition to meet and greets. 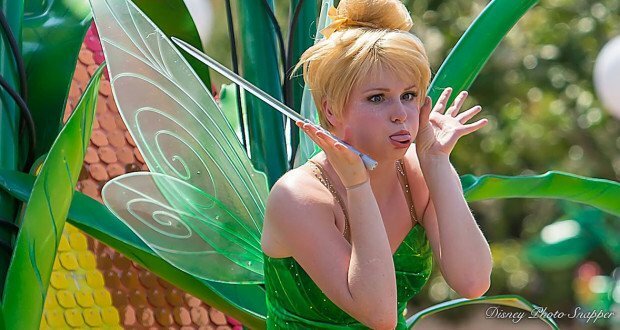 You may have gone into your audition hoping to be Tinker Bell, but if the casting team decides you’d be better as a different character, that’s what you’ll be if you choose to take the job. You can mention in your audition that you think you look like a particular character or can do the mannerisms of a particular character, but ultimately it’s out of your hands. Even the face characters still have to pay their dues and play a furry character every so often. If a specific role is filled and the park has a greater need for a different role, your assignment may even change after being hired. One of Disney’s biggest rules is for Cast Members to help keep the magic alive. This means not sharing which character you play, because the characters are themselves and there’s only one of each as far as the children know. One way Cast Members have gotten around this rule is to say they “play with” or they “know” certain Disney characters as a way of explaining who they portray in the parks. But while you are working for Disney as a character, you can’t break the illusion and tell people who you play. For more information about Disney characters consider planning and booking your next Disney trip with an Authorized Disney Vacation Planner you can trust like Mickey Travels. They’ll help you get the best Walt Disney World deal, share expert advice and their services are totally FREE! It’s genius!